COCTEAU TWINS QUE SE DIGNARON A TOCAR EN ESPAÑA POR PRIMERA VEZ, LLEVAN YA DOCE AÑOS EDIFICANDO CASTILLOS EN EL AIRE (¿O ERAN CATEDRALES?). ABANDONARON 4AD Y SE PASARON A FONTANA, DONDE ESPERAN ENCONTRAR MAYOR RESPALDO A SU INTRANSFERIBLE SONIDO OLD AGE. 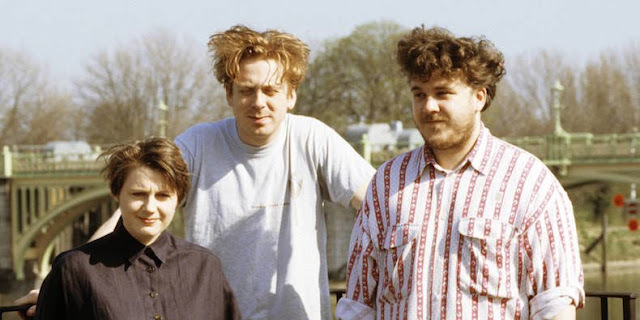 Era la primera vez que los Cocteau Twins tocaban en España y el trío aprovechó la vista para promocionarse en nuestro país. Antes de salir a escena, Elizabeth Fraser [cantante] y Simon Raymonde [bajista] concedieron unas cuantas entrevistas a los periodistas que aguardaban su turno en fila india. RDL eran los segundos; delante suyo, RNE atosigaba a la pareja con un cuestionario faraónico, gracias al cual pudimos enterarnos de:  no tienen ninguna intención de grabar un Lp de versiones de Nina Simone,  no piensan colaborar de nuevo con Harold Budd y  no pretenden hacerse con el público de la new age con su último disco, "Four-Calendar Café" (93). ¿Qué os a impulsado a cambiar de compañía discográfica? ¿Estabais hartos de 4AD? Si tan mal acabasteis con 4AD, supongo que no tocaréis el tema "Ivo" en directo, aunque os lo pida el público. [Simon] No estamos enojados ni con Ivo ni con el resto de directivos de 4AD. Nadie tiene la culpa de lo que ocurrió... No la tocamos, simplemente, porque no lo hemos hecho nunca. Quizás algún día lo hagamos, dado que es una buena canción. ¿"Four-Calendar Café" es vuestro disco más pop? [Simon] Lo era "Heaven Or Las Vegas". Aquel era mucho más comercial. [Elizabeth] Creo que es el más arriesgado desde que debutamos con "Garlands", nuestro primer LP. La prensa musical inglesa ha dicho que es el primero en que se entienden las letras desde "Head Over Heels". [Elizabeth] ¿Tú crees que se comprenden?... ¿Me estás tomando el pelo? Dudo que alguien las pueda entender. ¿Por qué cambias la dicción de las palabras en tus canciones e incluso te las inventas? [Elizabeth] No lo hago conscientemente, más bien al contrario, de un modo natural y espontáneo, aunque parezca que es adrede. Cantar de este modo me satisface tanto que se ha convertido en una obsesión. Disfruto con ello. En una vieja entrevista publicada en "Rock Espezial" Simon afirmaba que él y Robin componían en el estudio, mientras tú, encerrada en otra habitación, escribías los textos escuchando lo que tocaban a través de las paredes. [Elizabeth] Si hacen mucho ruido, supongo que puedo oírles, aunque tenga la puerta cerrada, por lo que quizás sea cierto que me influyen de forma inconsciente. [Simon] Nuestro método de trabajo es raro, aunque, después de utilizarlo durante doce años, ya nos hemos acostumbrado a él, de tal modo que no podríamos componer de otra manera. La mayoría de artistas intentan interpretar las melodías que les rondan por la cabeza con una guitarra acústica. Nosotros partimos de cero, creamos el ritmo con una batería y sobre él construimos el resto. Cuando acabamos cinco, diez o quince temas, se los pasamos a Elizabeth para que les ponga las melodías. Tenéis fama de que no os gusta tocar en directo y de que os horrorizan los largos tours, especialmente tras telonear a O.M.D. por toda Europa. [Elizabeth] La gira con O.M.D. fue mal porque éramos jóvenes e inexpertos. Nos cuesta tanto embarcarnos en tours largos porque tenemos familia, obligaciones, y no podemos abandonar mucho tiempo el estudio de grabación, que es lo que nos da de comer. [Simon] Antes creíamos que un grupo tan sólo tenía que componer. No nos interesaban los conciertos, las giras y las entrevistas, es más, nos horrorizaba todo ello. Hace dos años éramos tan malos en las entrevistas que llegamos a negarnos a concederlas. Poco a poco descubrimos que ser músico comportaba muchas más obligaciones que grabar un disco y que cuanto más hablábamos con la prensa, mejor respondíamos a sus preguntas. Es mucho más cómodo trabajar en el estudio, donde puedes controlar todo lo que pasa, que ir de gira sin saber nunca qué va a ocurrir. En un tour puedes aprender a superar los imprevistos, volverte más profesional, estar en contacto con el mundo real, averiguar qué opinan, realmente, los fans de tus discos, aunque la mayoría de ellos te digan que todo lo que haces es maravilloso. La opinión objetiva sobre nuestra trayectoria artística siempre estará a medio camino entre lo que te dice la gente que te adora y lo que publican sobre ti las revistas musicales. Seefeel os han teloneado en vuestra gira y Simon ha producido a Fuel. ¿Estáis interesados en el techno? [Simon] No especialmente. Me encantó tocar con Seefeel, es una banda estupenda, pero dentro de su estilo hay otra gente que me gusta más... como Richard James. ¿Qué os parece que bandas como One Dove o Saint Etienne os mencionen como una de sus influencias musicales? [Simon] One Dove no tienen mucho que ver con nosotros, hace música de baile, con una producción brillante. Creo que esas declaraciones son cosa de la prensa, que siempre se esfuerza en comparar a los conjuntos entre sí. Ayer, en una entrevista, me preguntaron si nos habían influenciado mucho New Order y los Smiths. Me pareció una pregunta estúpida. When a tornado rips through Kansas, Dorothy (Judy Garland) and her dog Toto are whisked away in their house to the magical land of Oz. 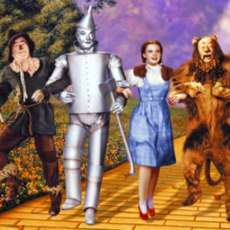 They follow the Yellow Brick Road towards the Emerald City to meet the Wizard, and en route they meet a Scarecrow (Ray Bolger) that needs a brain, a Tin Man (Jack Haley) missing a heart, and a Cowardly Lion (Bert Lahr) who wants courage. From Dorothy’s (Judy Garland) wistful ballad Over the Rainbow – where she dreams of life away from her dreary home – to the adventures along Oz’s Yellow Brick Road, every aspect of this classic film holds a special place in the public consciousness, and now audiences can experience it afresh thanks to this stunning 4K digital remaster. A cheerful garland of felted wool acorns! These would be perfect for parties, holidays, children's rooms, or just natural decor. The acorns are needle-felted of pure wool and set in a natural acorn cap. Each cap is drilled and threaded at 6-inch intervals onto a length of sturdy baker's twine. These acorns vary in size, as real ones do. 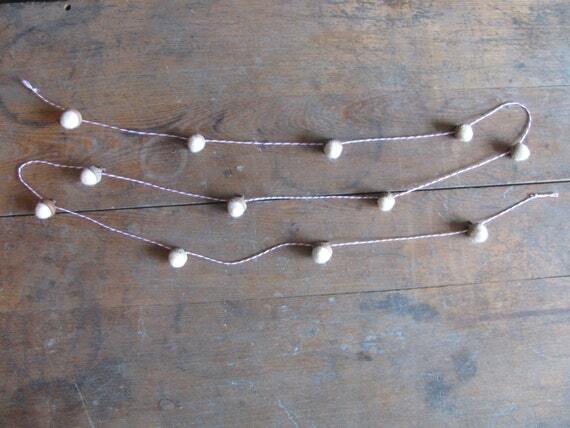 The length of this garland is 6 feet, and the color of the twine is red-and-white striped. If you'd like a different length or color of baker's twine, let me know and I would be happy to bring your ideas to life! Not recommended for children younger than age 3, as small items and loose fibers can be a choking hazard. It is ready to ship now and will arrive in the packaging seen in the 5th picture above. This hot air balloons felt garland/ banner/bunting has been designed and made with lots of love and care by me and my sisters. It is a wonderful addition to your home, your children’s room, your wedding decoration or party decor. All our garland are made by hand in a smoke and pet free home. 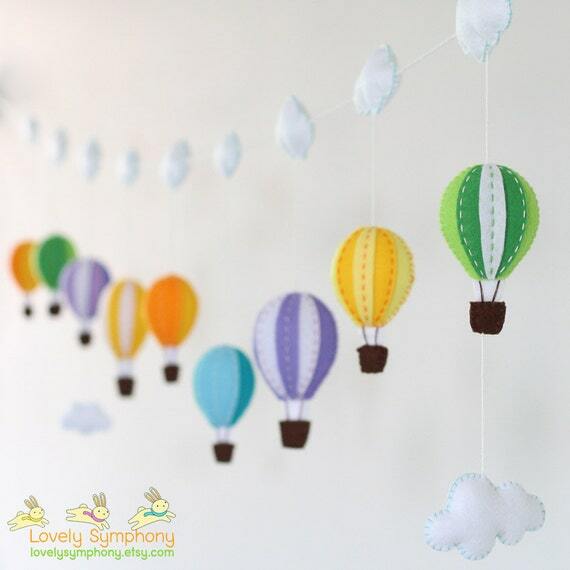 This hot air balloons baby garland contains 9 colorful handmade acrylic felt and eco friendly felt hot air balloons plus 11 clouds. We cut and hand-sewn each item then fills it with pure polyester fiber. The garland measures approx. 114 " long ( 64" for all the 9 hot air balloons and 25" on each side of the string) . Each hot air balloon is 2.5" wide by 3.5" tall. I combine all of the hot air balloon with natural white cotton string. You can customize the colors and the size of our felt garland just contact me and we can discuss your ideas. If you don't leave any requirement in the note, I will send you the mobile that similar on the image. All our baby garland are made to order. You can expect your garland to be shipped within 3-4 days after placing your order. I ship all items through Thailand Post air mail, by registered Mail. Shipping from Thailand should take about 14-21 days for most destinations. THE GARLAND IS NOT A TOY. PLEASE AVOID HANGING GARLAND THAT YOUR LITTLE ONE CAN EASILY REACH. We are honest and flexible. '''''A Child Is Waiting''''' is a 1963 American [[drama (film and television)|drama film]] written by [[Abby Mann]] based on his 1957 ''[[Westinghouse Studio One]]'' [[teleplay]] of the same name. The film was produced by [[Stanley Kramer]] and directed by [[John Cassavetes]]. [[Burt Lancaster]] portrays the director of a state institution for [[Mental retardation|mentally handicapped]] and emotionally disturbed children, and [[Judy Garland]] is a new teacher who challenges his methods. Jean Hansen, a [[Juilliard]] graduate, joins the staff of the Crawthorne State Mental Hospital and immediately clashes with the director, Dr. Matthew Clark, about his strict training methods. She becomes emotionally involved with 12-year-old Reuben Widdicombe (Bruce Ritchey), and is certain his attitude will improve if he is reunited with the divorced parents who abandoned him. She sends for Mrs. Widdicombe, who agrees with the doctor's opinion that it would be best if Reuben doesn't see her, but as she leaves the grounds, her son sees her and chases her car. Distraught, he runs away from the school. Dr. Clark finds him and brings him back the following morning, and Jean offers to resign. Clark asks her to stay and continue her rehearsals for the Thanksgiving pageant. On the day of the show, Reuben's father Ted arrives, having decided to enroll him in a private school. When he hears Reuben recite a poem and positively react to the audience's applause, he decides to leave him in the care of Jean, who is asked to welcome a new boy to the institution by Dr. Clark. Producer [[Stanley Kramer]] modeled the film's school on the [[Vineland Training School]] in [[New Jersey]]. He wanted to bring the plight of mentally and emotionally disturbed children to the movie-going public and try "to throw a spotlight on a dark-ages type of social thinking which has tried to relegate the subject of retardation to a place under the rocks." He wanted to cast Burt Lancaster because the actor had a troubled child of his own. [[Ingrid Bergman]], [[Katharine Hepburn]], and [[Elizabeth Taylor]] were considered for the role of Jean Hansen, which went to Judy Garland, who previously had worked with Lancaster and Kramer on the 1961 film ''[[Judgment at Nuremberg]]''. She was experiencing personal problems at the time and the director felt a supportive work environment would help her get through them. When original director [[Jack Clayton]] was forced to withdraw due to a scheduling problem, he was replaced by John Cassavetes, who was still under contract to [[Paramount Pictures]], on the recommendation of screenwriter Abby Mann. Cassavetes was fond of [[improvisation]] and his approach to filmmaking clashed with those of Kramer and the leading players. Most of the students in the film were portrayed by actual mentally-challenged children from Pacific State Hospital in [[Pomona, California]]. After the film's release, Kramer recalled, "They surprised us every day in reaction and what they did." Lancaster said, "We have to ad-lib around the periphery of a scene and I have to attune and adjust myself to the unexpected things they do. But they are much better than child actors for the parts. They have certain gestures that are characteristic, very difficult for even an experienced actor." Problems arose between Kramer and Cassavetes during post-production. Editor [[Gene Fowler, Jr.]] recalled, "It was a fight of technique. Stanley is a more traditional picture-maker, and Cassavetes was, I guess, called [[Nouvelle Vague]]. He was trying some things, which frankly I disagreed with, and I thought he was hurting the picture by blunting the so-called message with technique." Cassavetes felt his personal feelings about the subject matter added to the disagreements between himself and Kramer, who eventually fired the director. In a later interview, Cassavetes said, "The difference in the two versions is that Stanley's picture said that retarded children belong in institutions and the picture I shot said retarded children are better in their own way than supposedly healthy adults. The philosophy of his film was that retarded children are separate and alone and therefore should be in institutions with others of their kind. My film said that retarded children could be anywhere, any time, and that the problem is that we're a bunch of dopes, that it's our problem more than the kids'. The point of the original picture that we made was that there was no fault, that there was nothing wrong with these children except that their mentality was lower." Cassavetes disowned the film, although following its release he said, "I didn't think his film – and that's what I consider it to be, his film – was so bad, just a lot more sentimental than mine." Kramer observed, "My dream was to jump the barrier of ordinary objection to the subject matter into an area in which the treatment of it and the performance of it would be so exquisite that it would transcend all that. Somewhere we failed." The year was 1929. The Bombay Government had appointed a Committee to investigate the grievances of the untouchables. I was appointed a member of the Committee. The Committee had to tour all over the province to investigate into the allegations of injustice, oppression and tyranny. The Committee split up. I and another member were assigned the two districts of Khandesh. My colleague and myself after finishing our work parted company. He went to see some Hindu saint. I left by train to go to Bombay. At Chalisgaon I got down to go to a village on the Dhulia line, to investigate a case of social boycott which had been declared by the caste Hindus against the untouchables of that village. The untouchables of Chalisgaon came to the station and requested me to stay for the night with them. My original plan was to go straight to Bombay after investigating the case of social boycott. But as they were keen I agreed to stay overnight. I boarded the train for Dhulia to go to the village, went there and informed myself of the situation prevailing in the village and returned by the next train to Chalisgaon. To save my dignity, the Mahars of Chalisgaon had put my very life in jeopardy. It was then I learnt that a Hindu tongawala, no better than a menial, has a dignity by which he can look upon himself as a person who is superior to any untouchable, even though he may be a Barristar-at-law. I found the untouchables of Chalisgaon waiting for me at the station. I was garlanded. The Maharwada, the quarters of the untouchables, is about 2 miles from the Railway station and one has to cross a river on which there is a culvert to reach it. There were many horse carriages at the station plying for hire. The Maharwada was also within walking distance from the station. I expected immediately to be taken to the Maharwada. But there was no movement in that direction and I could not understand why I was kept waiting. After an hour or so a tonga (one horse carriage) was brought close to the platform and I got in. The driver and I were the only two occupants of the tonga. Others went on foot by a short cut. The tonga had not gone 200 paces when there would have been a collision with a motor car. I was surprised that the driver who was paid for hire every day should have been so inexperienced. The accident was averted only because on the loud shout of the policeman the driver of the car pulled it back. We somehow came to the culvert on the river. On it there are no walls as there are on a bridge. There is only a row of stones fixed at a distance of five or ten feet. It is paved with stones. The culvert on the river is at right angles to the road we were coming by. A sharp turn has to be taken to come to the culvert from the road. Near the very first side stone of the culvert the horse instead of going straight took a turn and bolted. The wheel of the tonga struck against the side stone so forcibly that I was bodily lifted up and thrown down on the stone pavement of the culvert and the horse and the carriage fell down from the culvert into the river. So heavy was the fall that I lay down senseless. The Maharwada is just on the other bank of the river. The men who had come to greet me at the station had reached there ahead of me. I was lifted and taken to the Maharwada amidst the cries and lamentations of the men, women and children. As a result of this I received several injuries. My leg was fractured and I was disabled for several days. I could not understand how all this happened. The tongas pass and repass the culvert every day and never has a driver failed to take the tonga safely over the culvert. On enquiry I was told the real facts. The delay at the railway station was due to the fact that the tongawalas were not prepared to drive the tonga with a passenger who was an untouchable. It was beneath their dignity. The Mahars could not tolerate that I should walk to their quarters. It was not in keeping with their sense of my dignity. A compromise was therefore arrived at. 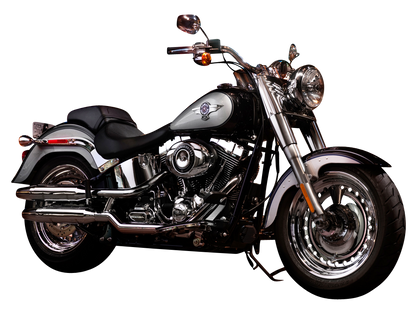 That compromise was to this effect: the owner of the tonga would give the tonga on hire but not drive. The Mahars may take the tonga but find someone to drive it. The Mahars thought this to be a happy solution. But they evidently forgot that the safety of the passenger was more important than the maintenance of his dignity. If they had thought of this, they would have considered whether they could get a driver who could safely conduct me to my destination. As a matter of fact none of them could drive because it was not their trade. They therefore asked someone from amongst themselves to drive. The man took the reins in his hand and started thinking there was nothing in it. But as he got on, he felt his responsibility and became so nervous that he gave up all attempt to control. To save my dignity, the Mahars of Chalisgaon had put my very life in jeopardy. It was then I learnt that a Hindu tongawala, no better than a menial, has a dignity by which he can look upon himself as a person who is superior to any untouchable, even though he may be a Barristar-at-law. I'm completely mesmerized by this Modern Classic Circus Party by Nancy Mantei of Nancy Mantei Events, out of Scottsdale Arizona! ...From the gorgeous and girly color palette to the glam decor and adorable treats, this fabulous party is sure to have you on your feet! The post Modern Classic Circus Party appeared first on Kara's Party Ideas. 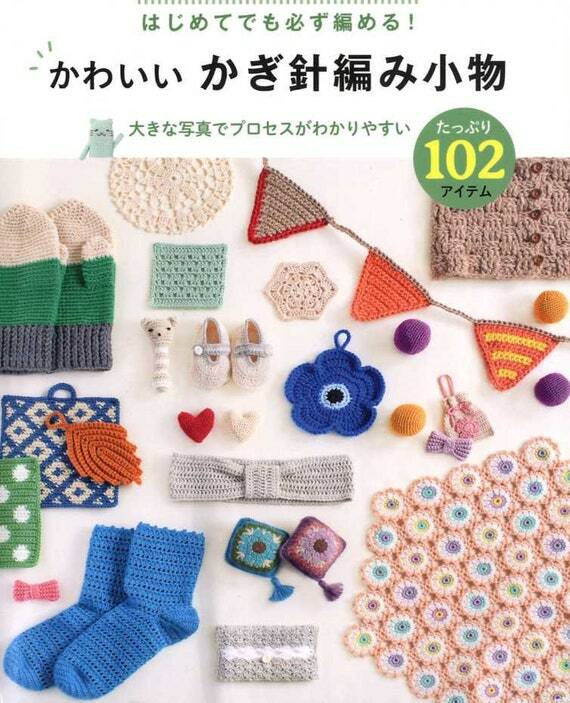 The book introduces easy to make 102 crochet Items with nice and large diagrams. + Small Items - Coasters, Doilies, Pot Mats, Glass Covers, Scrubbers, Floor Mop Cover, Curtain Tassels, Pocket Tissue Covers, Lucky Charms, Ornaments, Garlands, Pin Cushions, Cat/Squirrel/Rabbit/Owl Amigurumi, Halloween and Christmas Ornaments, and Baby Toys. + Stylish Items - Ribbons, Hair Bands, Necklaces, Hair Accessories, Tippet, Corsage, Snood, Neck Warmer, Muffler, Socks, Arm Warmer, Mittens and Hats. The book will be shipped out from JAPAN by Regular AIRMAIL to all over the world. Please allow 5 to 10 business days for delivery. From my experience, this method is always very fast and reliable. If you need a tracking number, I will ship your package as a registered mail. The registered mail fee is 410 yen per package, and please add this listing (https://www.etsy.com/listing/269394151/) in your cart at the time of your purchase. Thank you so much! 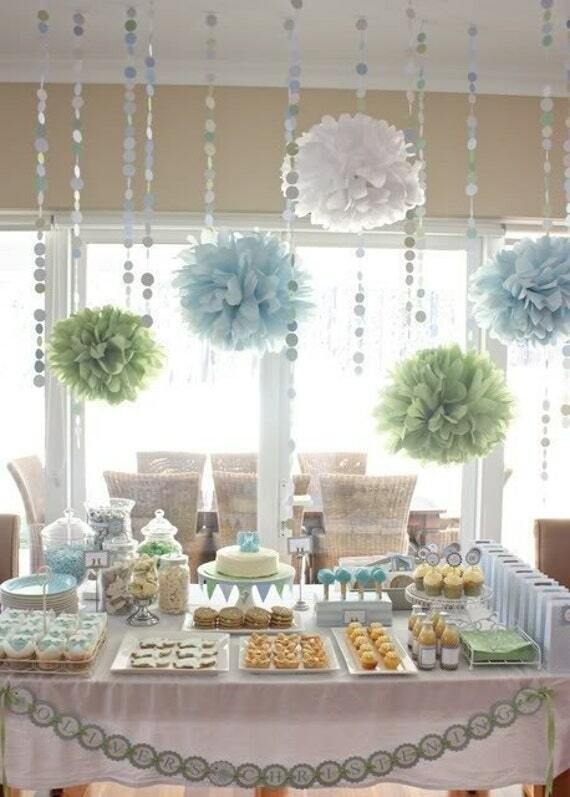 Finally a kit for one stop shopping for your special events :) Pompoms, garlands and a sweet name banner made this buffet table super sweet for a blue green and white baby boy sprinkle shower. This could make any event just as sweet - birthday party, wedding, anniversary, craft booth, class party, nursery decor, crib mobile, or even a backyard shindig! 2 medium poms ... 12"
2 small poms ... 8"
12 feet cardstock circle punch garland. if these are for an event, please specify exact date you need them by during checkout. If no date is left, I cannot guarantee delivery in time. Please see my policies section, shop announcements, and your receipt for more on lead time and shipping times. A Twitter user posted pictures of the incident in reverse sequence to present an inaccurate version of events. This elegant pre-lit Christmas garland can provide a welcoming feeling to any room in your home! This will be a perfect choice to display it in your door, windows or railings. Anurag Muskan you once utter in your mind Modiya,Jay's Papa Taklua ,Potato garlanded Sushma,Kudta huaa Ravi Prasad then what will be your condition try out that. Labour’s announcement that it will support automatic voter registration (Report, 12 April) is a welcome step in the right direction. Far from being radical, though, automatic registration is the common right across advanced democracies. All parties need to be looking at how to modernise our democracy when so many millions feel unheard and excluded. We need a registration revolution – steps to ensure that registration isn’t a lottery but is instead encouraged at every stage of interaction with official bodies, from sorting pensions to getting a driving licence or benefits. It’s time the “missing millions” were heard. The post കനയ്യകുമാറിനെതിരെ വീണ്ടും വ്യാജ പ്രചാരണം; ബിജെപിയുടെ തൊപ്പിയണിഞ്ഞയാള്‍ മാലയണിയിക്കുന്ന വ്യാജ ചിത്രം (വീഡിയോ) appeared first on Azhimukham. 50% of my INTL exposure is in SC, substantially overweighted relative to cap weighted indexes. Reasons: First, better diversification relative to US TSM which is dominated by US LC and plays in the same global markets as INTL LC. INTL SC tends to play not in global markets but in their home country markets which provides increased diversification. Agree with the foreign small cap overweight. Large US and large foreign are both dominated by multinationals and you do not get much diversification by substituting or overweighting one for the other. As far as outperformance of INTL SC vs INTL LC - who knows. Beach Wedding - Set of 10 Chair Decoration with 24 Ribbon Choices. Save on this set of 10 and decorate your beach wedding or event with this beautiful Natural Starfish decoration. Perfect for chairs or pews and could also be used to decorate reception and buffet tables. There are two natural starfish with 3 satin ribbons, 1 sheer ivory ribbon and a beautiful ivory beaded garland. First and second photos have aqua ribbons, third and fourth are mint ribbons. ~Length - 24" - 25"
There are 24 available ribbon colors. Please see last photo for colors.